I'll admit that I've found the return of Broadchurch frustrating. As soon as that title card ran at the end of series one, informing us 'Broadchurch will return' I've felt a little short changed. I've got over the fact we're getting a second now but I still have my frustrations. For a while now, I've been privileged enough to be privy to before transmission previews that allow me to get reviews written ready for transmission and it helps me to promote programmes on social media I think my followers will enjoy. I remember viewing the very first episode of Broadchurch and how excited I was about it. I showed restraint I didn't know I had, not taking to twitter and shouting things in violent CAPITAL LETTERS. I was instantly hooked. I was hooked so much that I stopped previewing it so I could be on the page as the rest of the country and enjoy the ride. My affection for the show grew with each twist and turn but as the credits rolled on that final episode, instead of the sense of fulfilment I was hoping for, I felt utterly deflated. I was lucky enough to speak with writer Chris Chibnall during his rollercoaster ride, and he told me that the series was designed to be a one story arch, so when the news it'll be returning I felt immediately conned. My feelings for this second series changed again recently because, as much as I enjoyed the first series, I think the show has started to think too highly of itself. We know nothing about this new series. Obviously its huge success means that this second outing doesn't warrant any of my tweets to convince people to watch it.. they will regardless. I can only hope/assume that the plans for this unplanned second series are so secretive because it's too good to let anyone see it before ITV pushes play. The first episode was by no means awful. The last truly awful first episode of an ITV drama in recent memory was Chasing Shadows, in fact just typing the title has caused a shiver. Perhaps the worst thing I can say about this opener is that it was.... well, a little dull. 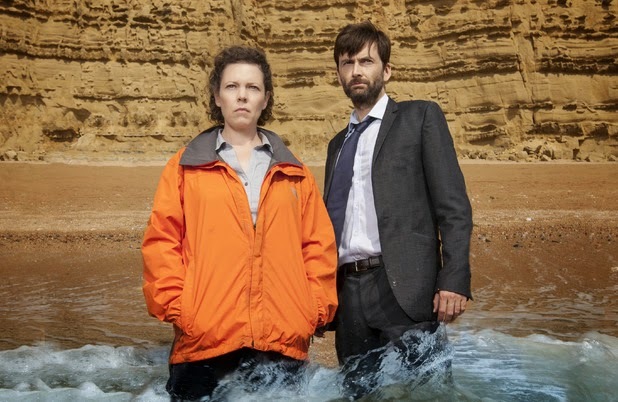 If we're focusing on the positives, I still think David Tennant and Olivia Colman are superb in their respective roles and I liked seeing how the Latimers were coping with life aftter Danny,but putting them and Olivia's distracting orange jacket aside, it was a rather dull opener given ITV's hype. I'm not sure what they were so keen to conceal from us all. Annoyingly the first episode focused on Joe Miller,who I still don't find overly menacing, pleading 'not guilty' at his court hearing. I'll admit I smiled as all those Broadchurch residents I'd grown to like last year gathered in the courtroom for the tense moment, but aside from that I found it all a bit too laboured. Then there's David Tennant who appears to be hiding the woman from Torchwood in his beautiful cottage because she'd testified against her husband in the Sandbrook murder case that Tennant's character was in charge of before his move to Broadchurch. Are you following? The episode didn't show near the same amount of promise that the original opener showed and I think it's a shame that now when we discuss the series as a whole it'll be a conversation of two halves. I can't see me being as involved, engrossed or as immersed in these 'new' stories as I was with the original. It's important to say that I'm writing this after just sat down and viewed the first episode. I'm sure given the time my feelings of disappointment will ease over time, and I will watch the remaining episodes as I'm still a fan of the original but, I guess I just feel that this second series didn't really need to happen. It's a worrying and frustrating current trend that broadcasters want their successful shows back. Not because they have anywhere to go but because they're obviously so desperate for a show to repeat its initial success. I just hope that I won't be writing the same thing about the second series of my beloved Happy Valley later in the year. I too was disappointed by tonight's first episode. I was expecting the court case and I was fine with Joe pleading "not guilty" but I didn't like the direction it took following that moment. I was expecting most of the focus to be on how the residents reacted to that display of defiance from Joe, and we did see some of that. However, it was intertwined with some lawyer internal politics that felt like scenes from "Law & Order: UK Goes Camping". The other plot involving Alec Hardy and the Sandbrook incident also wasn't a surprise but I struggled to make a connection with it. Our only knowledge of Sandbrook last series came via Hardy's recount. We barely know any of the characters from the Sandbrook incident, so why should we care that there's this woman fearing for her safety? I didn't. I wasn't thrilled at the news that Broadchurch was to return for the same reasons as you. 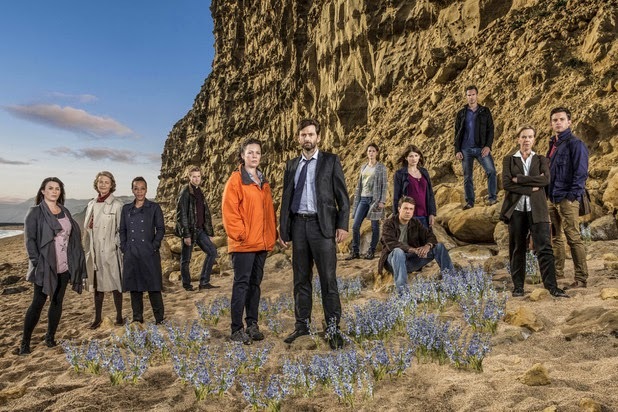 I've heard conflicting reports about whether Broadchurch was originally conceived as a one-off (as you heard from Chibnall himself) or a trilogy but I believe it was the former. However, I don't feel any of the above has clouded my judgement of tonight's episode. Unfortunately, it didn't do anything to allay my fears that the saying "leave them wanting more" carries a lot of weight. Very disappointing. Rather than tell an intriguing tale with strong characters, Chris Chibnall has chosen to delve straight into D-grade soap opera with random and unlikely meetings, people with ridiculous secrets and clichéd plot lines. Worst of all, Chibnall hasn't even bothered to do any research about exhumation or the conduct of criminal trials. A simple google search would have assisted in righting some of the howlers in just this episode alone. While not completely a failure, doubt I'll bother coming back next week. Very poor effort - with a little bit more effort and perhaps concentrating on the main trial plot rather than the stupid Hardy-Claire nonsense, this might just about have worked. There has been a lot of negative reaction already on the social networks, so this is unlikely to be anywhere near the success ITV might have hoped. I expect a massive drop off in ratings unless they can get the story telling back on track. At least we have Charlotte Rampling to look forward to and of course Olivia Colman was great - David Tennant continues to be badly miscast in this and I really wish they had killed off his walking cliché character at the end of last series. A very poor acting performance which really stands out like a sore thumb any time he is with the wonderful Olivia. Yes, didn't get any excitement from this after all of the hype and build up. Plot is just silly and I really feel that apart from Olivia Colman who was great, that the other actors weren't really invested in their parts. Definitely a case of lightning doesn't strike twice and once the thrill of this wears off, expect big drops in viewership. Certainly not the best start to a new year of television but have great hopes for Wolf Hall and Fortitude and of course the second series of Happy Valley, all of which should not disappoint in the way this has. Really shouldn't have made it as I think it is only likely to sully the original. Oh well, there's plenty of boxsets to catch up with on Monday nights instead! Just because this has turned out to be a flop, doesn't mean that sequels can't work out well. Good base material is the key. I, for one, am very much looking forward to the second helping of Happy Valley, a program which I found to be much better than the original Broadchurch in any way. I thought the first episode of Broadchurch 2 was enjoyable, but I was not blown away like episode one of the first series. It feels like Chibnall is playing Jenga. He took some unexplored pieces from series one (Sandbrook) and brought it to the forefront. It is very clear that Chibnall wants to 'broaden' the show and explore other avenues beyond the Danny Latimer case. Unfortunately I felt like the two cases did not merge very smoothly. Any momentum build up by the original cast got slowed down when Alec and Claire talked about Sandbrook. But yet Olivia Coleman was able to sell it a little bit once she go involved. I will be curious to see if Chibnall and company can pull this off. P.S. - It is always good to see Marianne Jean-Baptiste on my screen. I was a hug fan of her's since Without A Trace. You've hit the nail on the head I think. The B story line with DI Hardy really jars and is not particularly interesting and the plodding approach to this in the opening episode didn't exactly build confidence this was going to be as finely played as the main story line about the trial. I am certain this has been grafted on solely to give David Tennant more screen chewing time and I already have a bad feeling this is going to degenerate quickly into melodrama at its worst. It's a pity as I felt that Tennant's very hammy acting almost unbalanced the delicate and subtle acting of the rest of the cast in the first series and looks likely this time that it will actually tip Broadchurch 2 over into just soap. Fingers crossed that things improve but it is certainly slipping pretty quickly from my must watch list.